Lock in a great price for Holiday Inn Düsseldorf Hafen – rated 8.3 by recent guests! Close to S-Bahn and tram station, close to Media Hafen, overall nice neighbourhood with some great cafes and restaurants within walking distance. This was by far the best Holiday Inn I have ever stayed in!Everything was first class all the way.100% clean with a modern look to it.The price was so inexpensive, we thought there was a mistake.In the US it would have been three or four times the price.Staff was so friendly and caring.Worth every penny. A large sealed bottle of sparkling water and two glasses are waiting for you as you enter your room too. The room felt clean all the time! The housekeeping staff are second to none! The receptionist she are helpful and very polite. 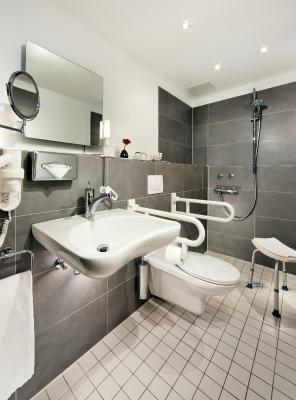 Holiday Inn Düsseldorf Hafen This rating is a reflection of how the property compares to the industry standard when it comes to price, facilities and services available. It's based on a self-evaluation by the property. Use this rating to help choose your stay! This 4-star hotel offers comfortable rooms with free Wi-Fi internet, excellent transport links to Düsseldorf city center, and delicious cuisine in the restaurant or on the terrace. Fitness machines and an infrared sauna are available in the neighboring fitness club. The hotel has rental bikes for exploring the surrounding area. The hotel bar serves fine wines, exotic cocktails and refreshing draft beers. Trams are just a 2-minute walk away from the Holiday Inn Düsseldorf Hafen, providing fast connections to the center of Düsseldorf. The airports of Düsseldorf and Cologne/Bonn can be reached within 35 minutes by car. Bilk is a great choice for travelers interested in convenient public transportation, sightseeing and walking. 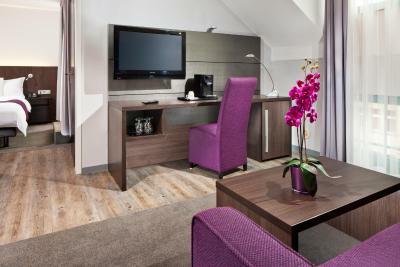 When would you like to stay at Holiday Inn Düsseldorf Hafen? This twin/double room has air conditioning, flat-screen TV and soundproofing. This double room has a garden view, soundproofing and air conditioning. This double room features a bathrobe, soundproofing and air conditioning. House Rules Holiday Inn Düsseldorf Hafen takes special requests – add in the next step! Holiday Inn Düsseldorf Hafen accepts these cards and reserves the right to temporarily hold an amount prior to arrival. A deposit is taken from your card on arrival of the full amount + 50EUR per person. The staff were very helpful! There was smell of tobacco in my room. There was only option with 2 beds when I requested king size single bed. Carpet is not ideally clean. Good location near s train station and tram station to downtown. Ridiculous parking fee when parking in Holiday inn's parking garage. We arrived 21.30H and left the next day at 9.00h and had to play € 18 And above all we bought two bags of crisps and a can of cola at the reception way to expensive. The bathroom is very clean. - staff didn't inform us properly - even after communication with HQ from Holiday Inn staff neglected us and didn't want to open dialogue. Probably last time booked with HI because of this hotel's staff. - Central hotel with great room value for the price. - Bed was nice and shower temperature and beam were great. Room was not cleaned for one day. room was not well aerated. Great staff, great breakfast, Greta location. the staff..the accommodation is perfect..breakfast is excellent ....everything very good . .
- no sticker on toilet (sterilized- hygiene)? - no plastic around drinking glass on toilet (sterilized - hygiene)? The first room what they offer to us very small corner room which completly disappointed us. The bathroom wasn't equipped neither with soaps, body lotions and sampoons. The breakfast was nice, had a good variety of food. There was hungarian language speaker staff. He was very friendly to us.